The second nights sleep wasn't filled with trout breaches and epic battles like the previous night and I woke up multiple times in a nightmarish sweat. Day three was a write off as far as fishing was concerned and with an insurance claim filed and the vehicle retrieved the only thing left to do was secure a way home. After explaining our predicament to a good friend back home and making him an offer he couldn't refuse, we had a ride lined up for late in the afternoon on what was to be our fourth and last day on the trip. The sense of relief my wife and I both felt was indescribable to say the least. After a hike through town for some food, the rest of the day was spent in the motel room recovering from the previous days events and trying to get over the shock. Sleep didn't come easy that night and definitely wasn't pleasant, but within 24 hours we were to be home in our own bed. The next morning was as windy as the previous three, the sky grey and air cool. We still had eight or 9 hours to go before getting picked up and there was no way I could sit in the motel lobby knowing that just over a mile away were trophy trout swimming about. My wife on the other hand was in no mood to sit on shore and quite content to stay behind with her laptop. 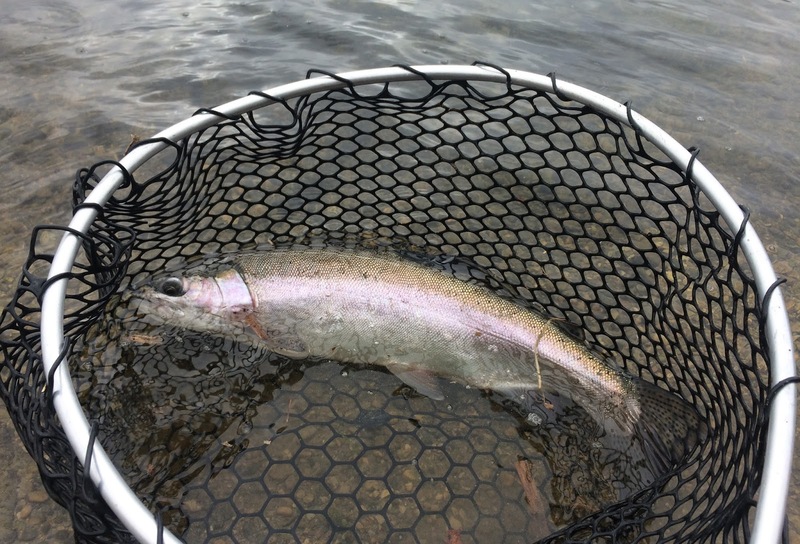 I packed up a rod, some basic tackle, a few drinks and snacks, layered up in some winter clothes, grabbed a net, kissed my wife and headed off on foot towards the lake, determined as I had ever been to catch a trophy trout. The following four and a half hours of fishing were nothing short of legendary. A true fisherman's tale unfolded that no one would believe if I told them. I shared the lake with two pairs of herons and a few pairs of ducks but besides that there wasn't a soul around, except those lurking beneath the water. Just me, my fishing rod, some trusted tackle and a net. After catching and releasing two 15 inch rainbows within ten minutes of arriving, I had a feeling I was in for a treat, and boy was I ever! Had the stars had aligned? Was the water temperature just right? Was a shift in the weather on it's way? 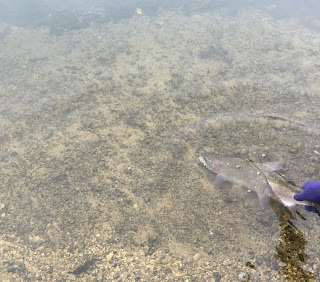 Whatever the case, I ended up catching and releasing well over a dozen trout, with five rainbow trout to shore over 20 inches in length. The biggest of those measured a whopping 27 inches and the fight will be forever burned in my memory. The battle went on for a few minutes with multiple breaches throughout as it twisted and thrashed all the way to the net. 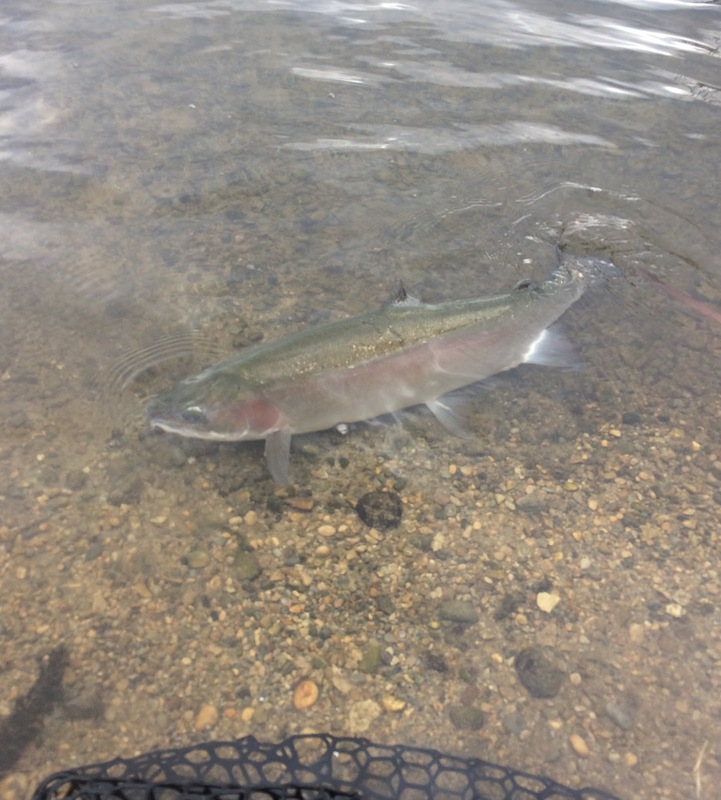 Ice cold to the touch, after a measurement and a few pictures in the net, it released with vigor back to the weed line. 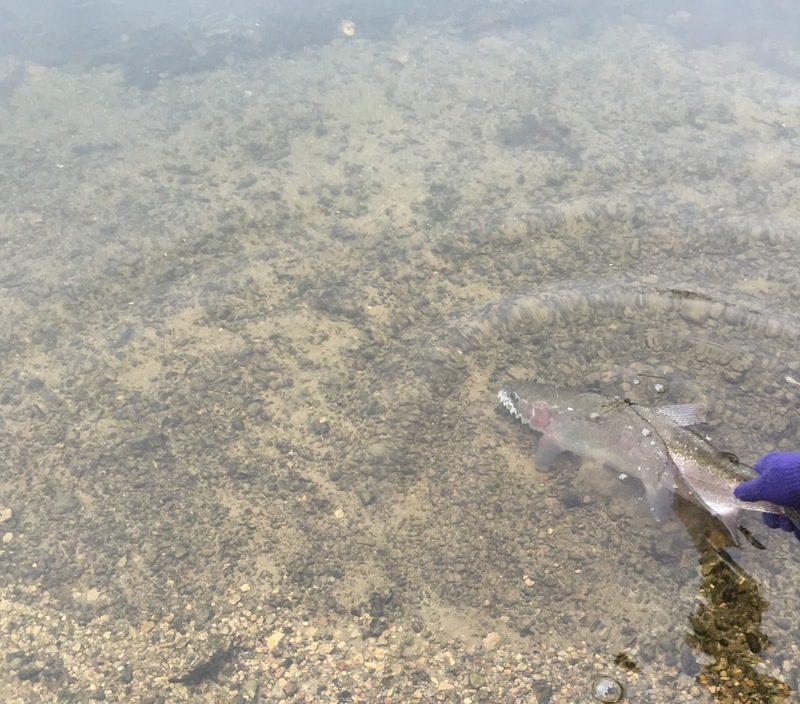 Countless other rainbow trout under 20 inches were caught and released over the session, with more missed takes and lost fish than anyone would believe. It was one of the hardest bites to walk away from that I have ever experienced, but our ride was near and I had a mile to walk back to the motel. 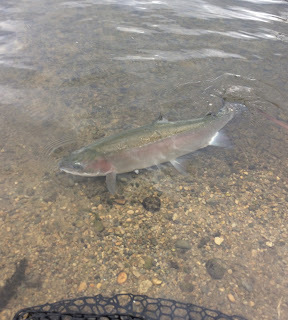 The air was sweeter and the walk almost effortless as I made my way back, thankful to be alive and beyond content with the few hours of steady action and the handful of trophy rainbow trout caught and released.